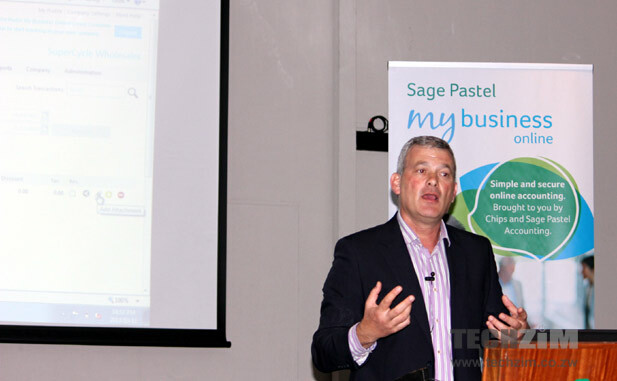 Yesterday we attended a press briefing where Pastel (Both the local distributor, Chips, and South Africa) and Utande announced the launch of Sage Pastel My Business. The actual launch is today so yesterday was dedicated purely to showing journos why the new accounting in the cloud, is a big deal. And that they did! We know we walked out of there feeling this was at last a software solution that matches the advances in local connectivity. it also simplifies stuff though about so far is thought of as belonging to established businesses and operated by specialist accounting people. Add to that the fact that unlike numerous other cloud accounting solutions available on the internet, this is pre-configured for the Zimbabwean accounting and tax environment. And all that for $20 a month! We think it’s a great deal for startups. Back to the actual briefing; it was attended by Softline Pastel MD Stephen Cohen, another SA executive called Rutendo Hwindigwi, Chips MD Rob Watson, and the Utande leadership. Like us, you probably already read the press releases sent out in advance of this launch, so we’ll dive right in and break down the stuff that we found most interesting and questions people likely have. If you have a question not answered here then let us know in the comments and we’ll get the info. How heavy is the website in terms of the data you use to do regular tasks like data entry and producing reports? Cohen explained that this should be the least of anyone’s worry as there’s data intensive heavy components the site uses. He compared it to 2 pages of emails and Utande added that a typical page would be about 16kbs of data. How much does it cost exactly and why that amount? The full pricing is on the website but basically you pay $20 a month and get 2 users, 2 companies, and 1 GB of data. Watson said the price is pegged to the South African (where they source the app) Rand so it may fluctuate depending. Utande says they’ll have a ZimSwitch Vpayments enabled for customers to pay like they do with their uMax product. So once the first free month expires, the users doesn’t need to physically go to a bank or Chips to pay. That options is available ofcourse. The application accepts CSV imports but you will have to figure out how to set the data fields accordingly. In short there are no conversion tools for other accounting packages that you may be using. Watson said though that those using the offline version of Pastel will however have a conversion tool available to them in in a few weeks. Can you take backups and store them on my local computer in case the Utande data center fails? You can take backups but Utande insisted that all data is already backup in real time and if anything would happen to their Harare data center, a South African based mirror would serve users the system. Cohen clarified that the offline backup you take is basically a backup to excel and not restorable back into the system. He however said that you will never need to restore a backup because everything is automatically backed up from the cloud already. Right now you can get an Android application and Cohen says they are building other applications for Apple and Windows mobile devices. They are only developing for smartphones though in terms of applications but nothing stops you from using the web version on a mobile device. In fact, those that do try this, please let us know. Cohen added that even though they have these mobile apps they are building, they still won’t have the whole Sage My Business on the app; it’l be specific components of the application like invoicing. According to Cohen, their offering is built for enterprise heavy stuff like SAP, so features were built with the startup in mind but with enough sophistication for businesses that want to have their accounts handled by professional accountants. Watson added that their pricing was significantly lower than that of Cumulus; $20 vs $125. Good luck! After getting the platform right and ready, celebrating in pop and fan fare, the real work begins. Convincing business uptake! Can I have my data returned to me should I choose to discontinue with My Business Online? No. There is currently no single export file that can be returned to you, however, you are able to print all reports and export to Excel. Since you already have a desktop application; Pastel, does it not make sense to make users able to revert back TO YOUR desktop product should they wish to discontinue the cloud offering. So wouldnt making an export file or files tor an interface that can make a restoration of cloud data onto the traditional Pastel make sense? So it means if a business migrates from a conventional accounting package(esp. Pastel) to your cloud offering, then discontinued, they are blasted back to the stone age. Accounting by Excel. Surely you can create something that makes this less painful. It will be targetting your very own Pastel, after all. How do I backup my data on My Business Online? There is no need for you to back up your own data. Your data is backed up daily and all backups are stored for two weeks. Your data is further stored in two different locations accommodating multiple points of failure. You commented on this too, in the article. Putting on the shoes of an IT person, who is going to influence a decision and have some kind of backup policy especially for financial data, I strongly believe it is important to be able to backup some sort of file or format that could then also be restored. But then thats me. Do you retain history of the previous financial years? Worth mentioning that whoever decides on this has to have A RELIABLE INTERNET CONNECTION, and POWER WHEN NEEDED. I thought there was a product here in Zim which has already been doing the above mentioned ,quite a number of companies have been using it for 2years now.The product is called HansaWorld.It works native on apple prodcts,Linux and windows and on Tablets it works on android and ipad.i know of a couple of supermarkets who are currently running on a Hosted solution using the same system.